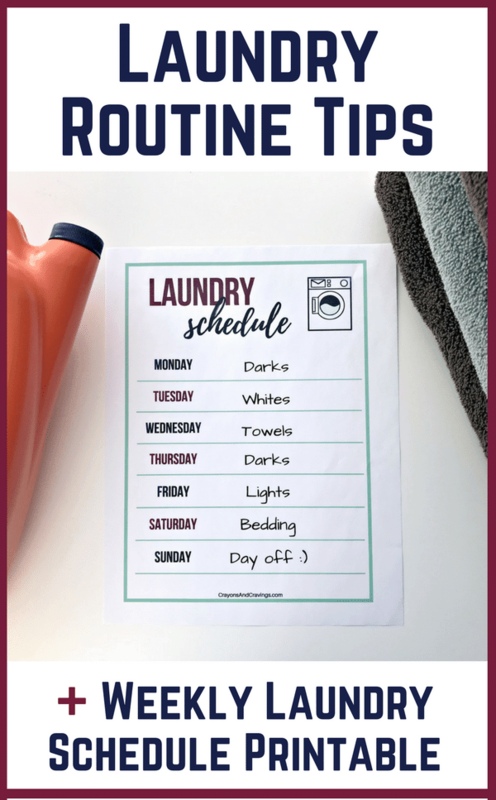 Stay on top of your laundry pile with the help of these smart laundry routine tips and free laundry schedule printable. Nothing is worse than finding out there are no clean towels when you are about to hop in the shower, or discovering on Monday morning that your little one has no clean shirts to wear to school. They key to avoiding a backlog of dirty laundry is to create a laundry routine and laundry schedule that works for you and your family. Once you get your laundry schedule down, you will be able get your laundry done on a consistent basis. This, in turn, will keep you from falling behind and winding up with a huge pile to catch up on. While doing laundry is never going to be loads of fun (see what I did there? ), it doesn't have to be torture either. I used to dread laundry day, but now that I have finally gotten my laundry room organized and my laundry routine down, doing the wash has become one of my more prefered chores. 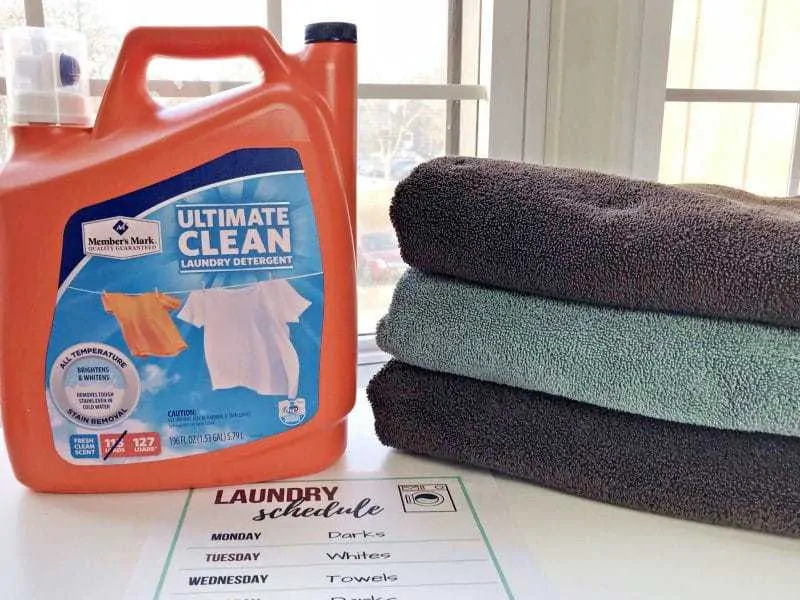 Read on for some smart laundry tips, a downloadable laundry schedule printable, and some suggestions for creating a laundry schedule that will work for you. Nothing will throw a wrench in your laundry routine like running out of laundry detergent. Avoid running out by making sure that you always have plenty of laundry detergent. 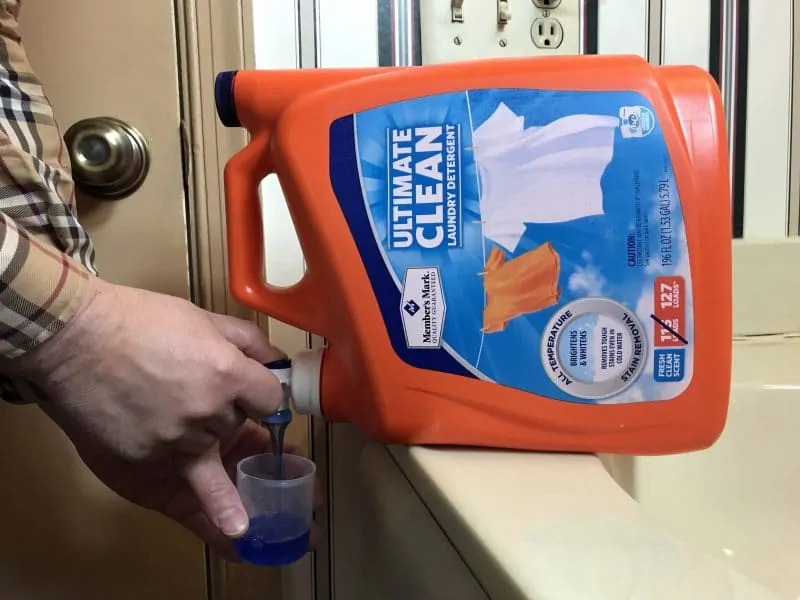 I have found that Member’s Mark Ultimate Clean Liquid Laundry Detergent is truly a fantastic value and offers the perfect clean for my family. The large amount of detergent in each container helps to ensure that we never run out. 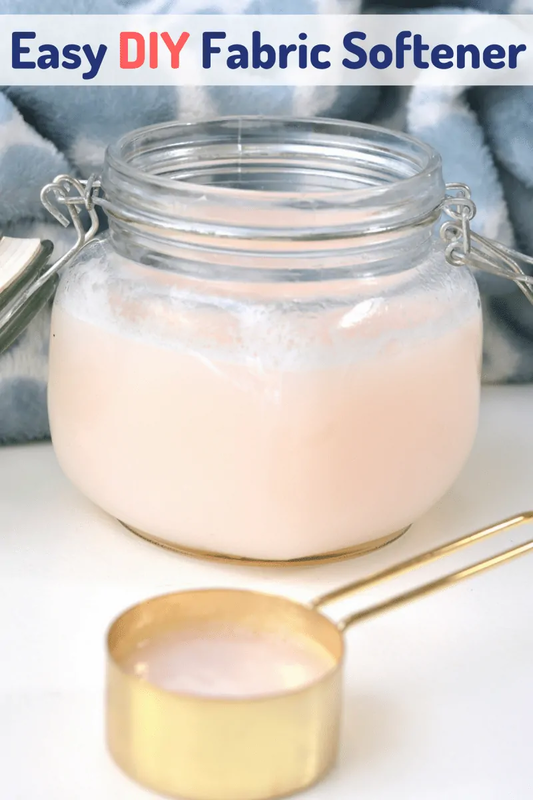 Plus, Member’s Mark Ultimate Clean Liquid Laundry Detergent does a great job of cleaning our clothing well the first time around, so I am never aren't stuck wasting time re-washing your loads. In fact, the newly formulated Member’s Mark Ultimate Clean Liquid Laundry Detergent fights stains and brightens whites even better than before. That's not all that got an upgrade – lookout for their new packaging as well. 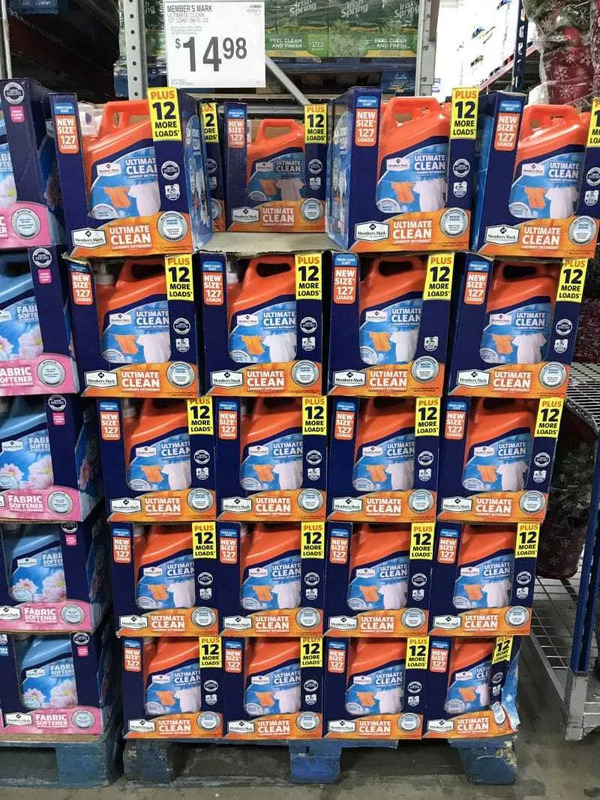 You can purchase Member’s Mark Ultimate Clean Liquid Laundry Detergent at your local Sam's Club or online at samsclub.com. Use a 2 or 3 bin hamper to sort clothing as you take it off. 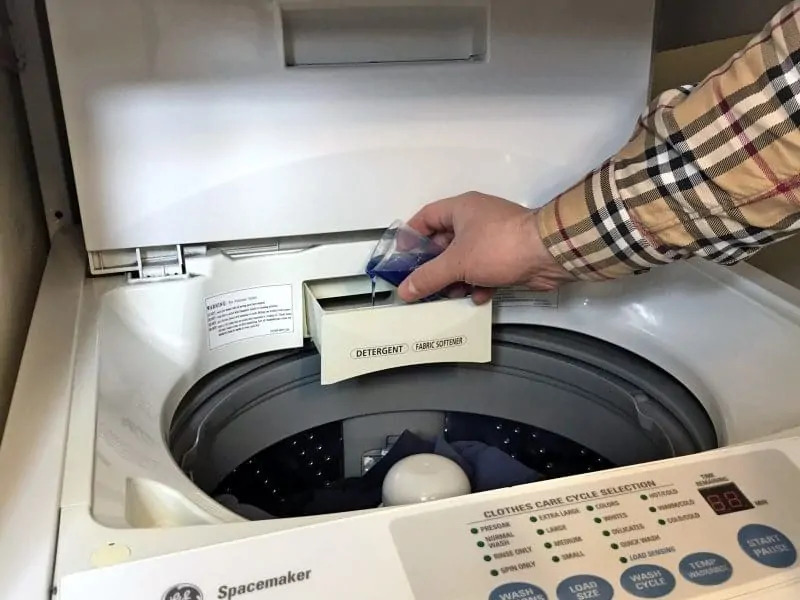 By tossing whites in one basket and darks in another you can eliminate having to dig through dirty clothing to sort it when it is time to do the wash. Instead, you can simply toss an entire bag into washer without having to sort a thing. 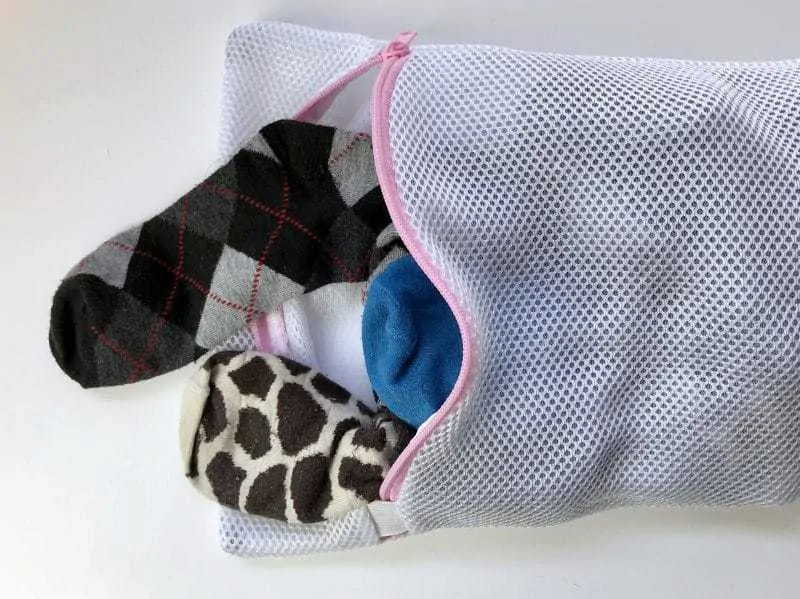 Prevent socks from going missing by washing them in a mesh laundry bag. Clip a mesh laundry bag to the side of your hamper and place socks right in there as you remove them. Then, when it is time to do the wash, simply zip up the mesh laundry bag and toss it in with your other clothes. This simple tip is such a time saver when it comes to folding and putting away the wash. Ask family members to turn their clothing right side out before tossing it into the hamper. This way, when the clothing comes out of the dryer it is ready to be put away, without having to be turned right-side out. Now this is a tip that I was thrilled to discover. When I write with a dry erase marker on the top of my washer it wipes right off easily. 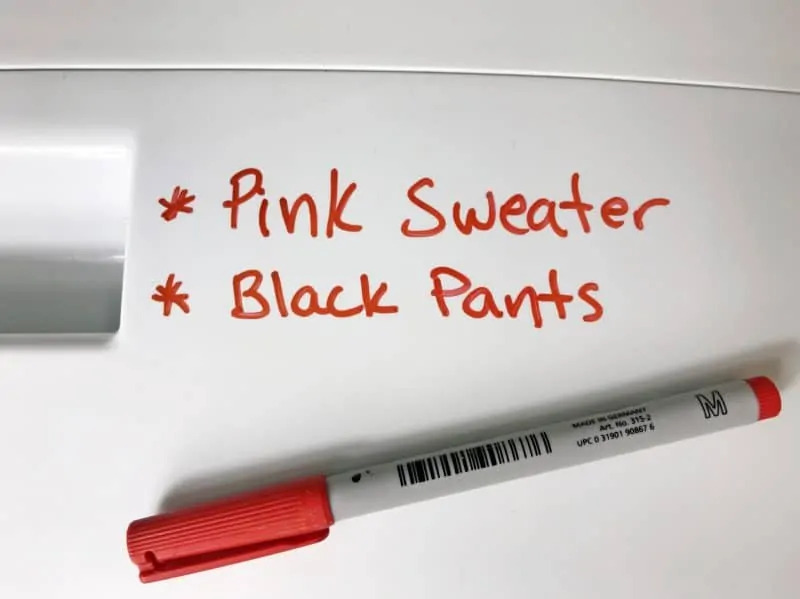 Now, I use a dry erase marker to make note of any hang dry items in the wash, so that they don't end up getting put in the dryer. This is especially helpful if there are multiple people in the house who do the wash. For example, if I put a load in the washer my husband might go in and move it to the dryer. A quick note on the top of the washer is the perfect way for him to see what items can't be put in the dryer. Hate folding the laundry? This may sound silly, but if you making folding time more enjoyable and more positive of an experience, you will find that you won't dread it as much. Make folding time more enjoy by turning on the TV or radio. Or, if you prefer, simply enjoy the few minutes of quiet time that you have to yourself! Planning out your laundry schedule will help you from falling behind and ending up with a mountain of laundry waiting to be done. 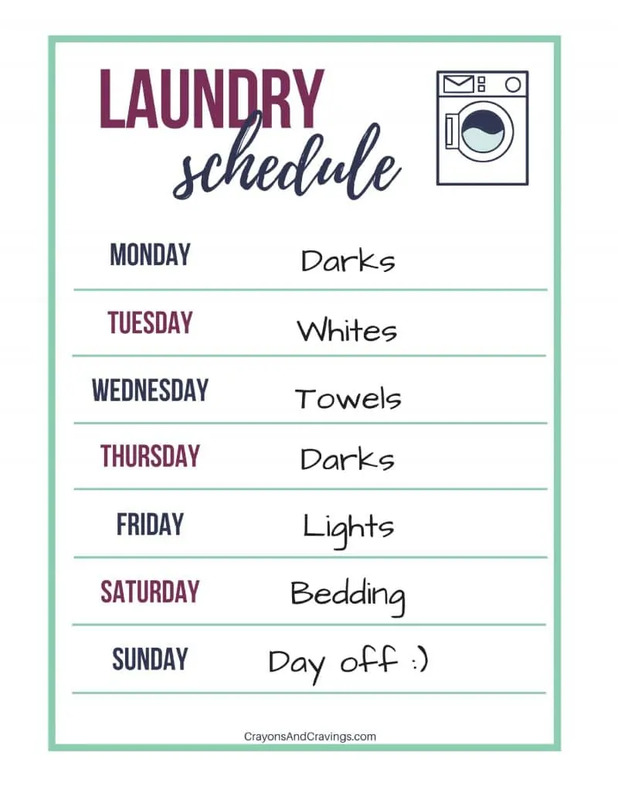 Before filling out your laundry schedule printable it is important to consider what your laundry schedule will need to look like. I would recommend trying to plan for at least one load of laundry per day. Of course, if you live alone or with just one other person you can probably get away with doing your wash less often. The point is to avoid having to do multiple loads on one day. 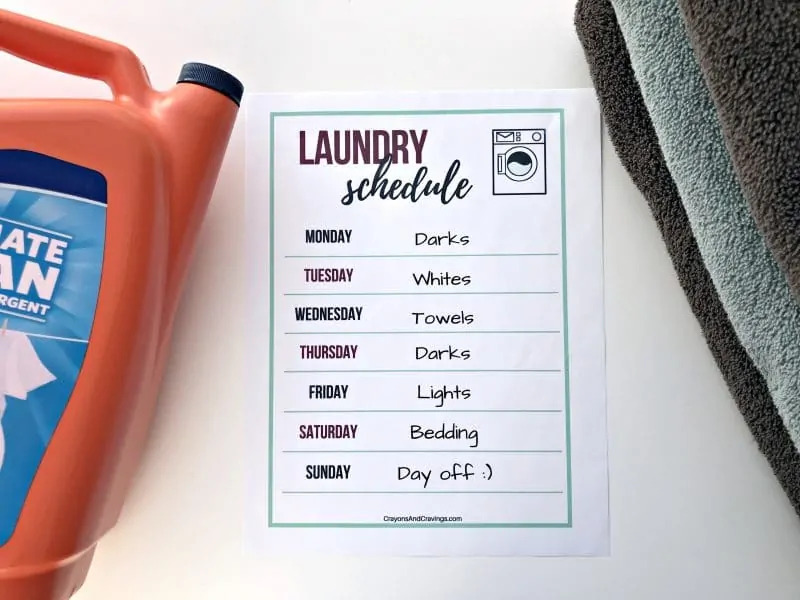 Keeping your laundry schedule to one load a day keeps things simple and manageable, which helps prevent you from dreading the chore or trying to skip it. How many people are you doing laundry for? How many loads do you have to do per week? What days of the week is doing laundry possible? How many loads can you get done in a day? Would you rather do 1 load per day, everyday or do 2 loads per day, every other day? There are no right or wrong answers to these questions – they are just simply things to consider when planning out your laundry schedule. For me, I have found that what works best is doing 1 load of laundry daily. I simply pop in a load, go about my daily routine, and then pop in to move it to the dryer. An hour later I fold it and put it away. Having to do just one load is manageable and keeps me from falling behind. 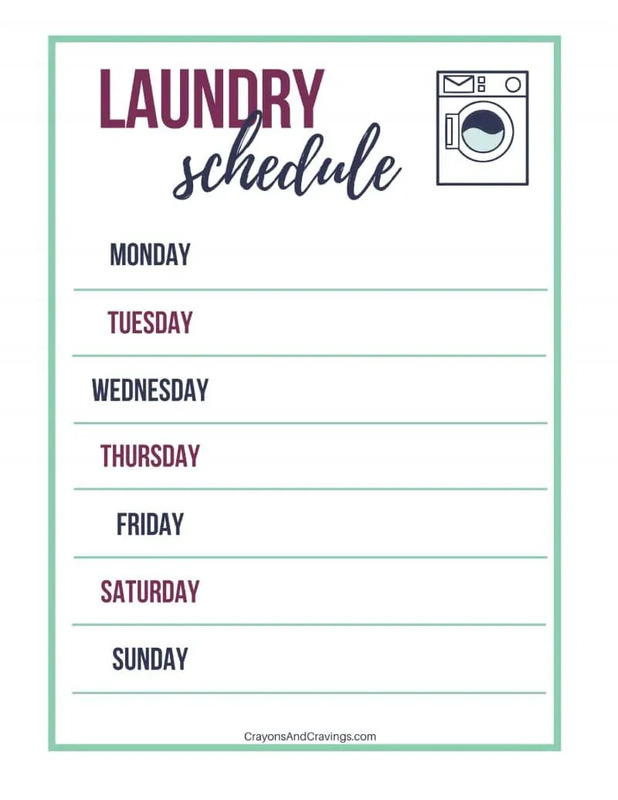 Download and print out this free laundry schedule and fill it in with the laundry schedule that you have decided on. Or, if you would prefer printing out the already filled-in version of the schedule I use, you can do so here. 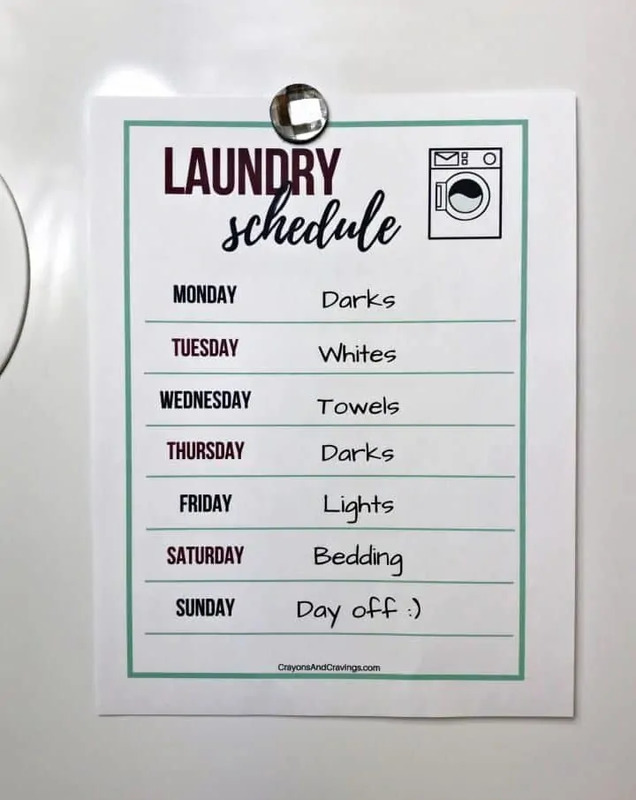 I have found that the laundry schedule printable is perfect for hanging on your washer or dryer with a magnet. Framing the printable schedule also works well, and allows you to write on the glass with a dry erase marker and erase it should you decided to change up the schedule for that particular week. What are your laundry tips? 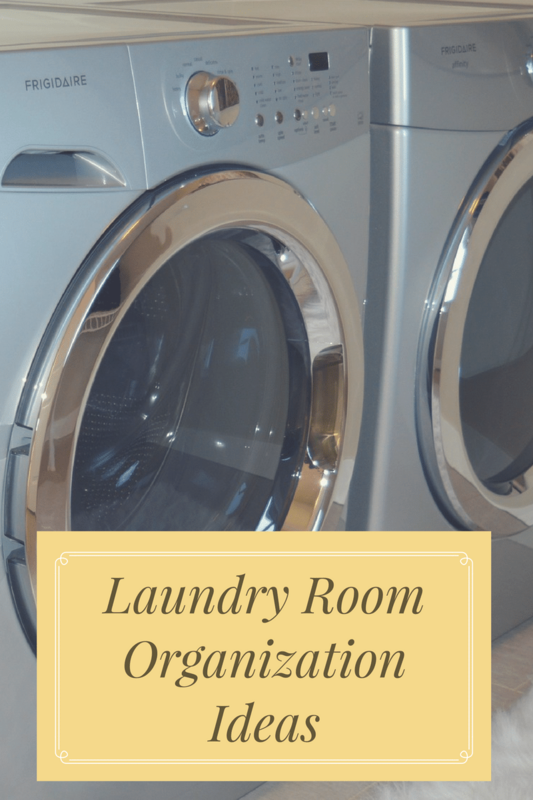 I hope that you find these tips and laundry schedule printable helpful. If you have any laundry routine tips that I forgot to mention, please let us know in the comments below. I am always looks for more great laundry ideas! Best choice I made last year was having the teenagers take over washing their own clothes. it is so much easier for me to not wash the 12 shirts they wore for exactly 5 minutes before throwing them on the floor! Love the printable. I like doing laundry, this is a help. It doesn’t stop you from accidentally putting a color in with the whites. When I was young, I put something red in with my brother in law’s undies with bleach, and they came out pink he was so mad, but I thought it was pretty funny at the time. Great tips and thank you for the printables.